The charity Alcohol Concern has issued a stark warning about the number of children drinking at dangerous levels. It has published a report estimating the cost of hospital treatment for underage drinkers in England to be about £19m a year. And the number of under-18s ending up in hospital after drinking too much is rising, the charity has warned. Young people should be given more support it says, but one expert said parents also have a role to play. Alcohol Concern's report, entitled Right Time, Right Place, states that alcohol contributes to 5% of young people's deaths - 1.4% more than in the adult population - and is "a significant problem for the UK". The UK also has the highest rates of teenage alcohol-related injuries in Europe. The number of under-18s admitted to hospital in England, where alcohol was a factor, increased from 10,976 in 2002/3 to 14,501 in 2007/8. In 2008/9 the number of admissions fell to 12,832. All these admissions figure exclude emergency department attendances, which could increase the number. 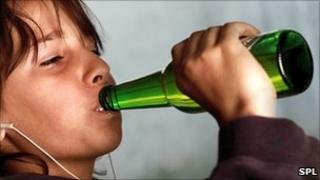 Last year, 8,799 under-18s accessed specialist treatment for tackling alcohol problems, the report says. The report calls for earlier identification of young people engaged in 'risky' drinking, such as young people attending A&E or getting into trouble with the police for alcohol. The minute that alcohol appears to be becoming a problem for a young person aged under 18, information, advice and support should be provided, Alcohol Concern says. Don Shenker, chief executive of the charity, said that drinking in children is a "huge problem". "Some of these youngsters are as young as 10. Remember these are children we are talking about and their bodies can't process alcohol like adults can." "We are extremely concerned about the damage to children's health." He maintained the costs of early intervention are far less than the costs of treating the health problems of long-term alcohol misuse by children and young people. "Training medical staff as alcohol specialists is a cost-effective measure. The 'do nothing option' is far more costly," Mr Shenker said. Professor Jonathan Shepherd, who directs Cardiff University's Violence and Society Research Group, said: "These findings demonstrate as never before the need to capitalise on every episode of emergency treatment to educate and protect." Professor Sir Ian Gilmore, chair of Alcohol Health Alliance UK, said: "We know that heavy drinking from an early age can diminish the life chances of the young person involved. It is important that parents realise they are role models - their behaviour in relation to alcohol has more impact than what they tell their children. "Equally, the wider community has a major role in pressing for policies around price, availability and marketing of alcohol that protect children." Susie Ramsay, policy adviser at The Children's Society, said that money and time could be saved if more resources were focused on preventative services. "Early intervention and preventative services have a proven track record, particularly with relation to young people's substance misuse. "If these are put in place, the number of young people being admitted to A&E due to drinking is bound to be reduced and money saved." A spokesperson from the Department of Health said: "This report shows the devastating impact that alcohol has on the lives young people who drink too much. "We must educate them so they understand how bad it is for their health now and in the long term. And we must do more to stop shops selling alcohol to under 18s. "Everyone has a part to play in this. Parents, police, education and social services need to work together. "The new Public Health Service will give communities the power and budget to tackle alcohol problems in their areas."